Producer: Wieland Schulz-Keil, Chris Sievernich, William J. Quigley (executive); screenplay: Tony Huston, from a story by James Joyce; cinematographer: Fred Murphy; editor: Roberto Silvi; music: Alex North; casting: Nuala Moiselle; production design: Stephen B. Grimes, J. Dennis Washington; set decoration: Josie MacAvin; costume design: Dorothy Jeakins; production manager: Tom Shaw; makeup: Fern Buchner, Keis Maes, Anthony Cortino, Louise Dowling, Anne Dunne, Christopher Shihar. Cast: Anjelica Huston ( Gretta Conroy ); Donal McCann ( Gabriel Conroy ); Helena Carroll ( Aunt Kate ); Cathleen Delany ( Aunt Julia ); Dan O'Herlihy ( Mr. Browne ); Donal Donnelly ( Freddy Malins ); Marie Kean ( Mrs. Malins ); Frank Patterson ( Bartell D'Arcy ); Rachael Dowling ( Lily ); Ingrid Craigie ( Mary Jane ); Maria McDernottroe ( Molly Ivors ); Sean McGlory ( Mr. Grace ); Kate O'Toole ( Miss Furlong ); Maria Hayden ( Miss O'Callaghan ); Bairbre Dowling ( Miss Higgins ); Lyda Anderson ( Miss Daly ); Colm Meaney ( Mr. Bergin ); Cormac O'Herlihy ( Mr. Kerrigan ); Paul Grant ( Mr. Duffy ); Paul Carroll ( Young Gentleman ); Patrick Gallagher ( Mr. Egan ); Dara Clarke ( Miss Power ); Brendan Dillon ( Cabman ); Redmond Gleeson ( Nightporter ); Amanda Baird ( Young Lady ). Awards: National Society of Films Critics Award for Best Film, 1987; Special Achievement Award (John Huston), Tokyo International Film Festival, 1987; Independent Spirit Awards for Best Director and Best Actress (Angelica Huston), 1988; Best American Film Award, Bodil Festival, 1989. McCarty, John, The Films of John Huston , Secaucus, New Jersey, 1987. Grobel, Lawrence, The Hustons , New York, 1989. Studlar, Gaylyn, editor, Reflections in a Male Eye: John Huston and the American Experience , Washington, D.C., 1993.
Cooper, Stephen, Perspectives on John Huston , New York, 1994. Cohen, Allen, John Huston: A Guide to References and Resources , New York, 1997. "Zenith and Huston to Team on The Dead ," in Variety (New York), vol. 325, 17 December 1986. Harmetz, A., "Patient: John Huston; Rx: Film," in The New York Times , 8 March 1987. Huston, T., "Family Ties," in American Film , vol. 12, September 1987. Cart, T. McCarthy, "Film Legend John Huston Dead at 81: Final Pic Bows at Venice," in Variety (New York), vol. 328, 2 September 1987. Wiener, D.J., " The Dead : A Study in Light and Shadow," in American Cinematographer (Hollywood), vol. 68, November 1987. Sante, L., "The Last Chapter: The Dead ," in Premiere (Boulder), vol. 1, December 1987. Cargin, P., "Huston's Finale," in Film (London), no. 10, December 1987. Kael, P., "The Current Cinema: Irish Voices," in New Yorker , vol. 63, 14 December 1987. O'Brien, T., "Screen: Ethnic Colorings— Emperor, The Dead , and Wannsee ," in Commonweal , vol. 114, 18 December 1987. Kauffman, S., "Stanley Kauffmann on Films: Last Rites," in The New Republic , vol. 197, 21 December 1987. Baxter, B., in Films and Filming (London), no. 399, December 1987. Pulleine, T., "A Memory of Galway," in Sight & Sound (London), vol. 5, no. 1, 1987/1988. Burgess, A., "The Task of Turning Joyce's Prose to Film Poetry," in The New York Times , vol. 137, section 2, 3 January 1988. Denby, D., "The Living," in New York Magazine , vol. 21, 18 January 1988. Varjola, M., "Elava Kuollut," in Filmihullu (Helsinki), no. 4, 1988. James, C., "Film View: When Film Becomes a Feast of Words," in The New York Times , vol. 138, section 2, 30 July 1989. Cardullo, B., "Epiphanies," in Hudson Review , vol. 41, no. 4, 1989. Shout, J.D., "Joyce at Twenty-Five, Huston at Eighty-One: The Dead ," in Literature/Film Quarterly (Salisbury), vol. 17, no. 2, 1989. Yetya, N., " Los Muertos ," in Dicine, no. 36, September 1990. "The Angel Gabriel," in New Yorker , vol. 68, 28 December1992/4 January 1993. Pederson, A., "Uncovering The Dead : A Study of Adaptation," in Literature/Film Quarterly (Salisbury), vol. 21, no. 1, 1993. Pilipp, F., "Narrative Devices and Aesthetic Perception in Joyce's and Huston's The Dead ," in Literature/Film Quarterly (Salisbury), vol. 21, no. 1, 1993. It's hard to think of a major filmmaker who relied more on literary adaptations than John Huston. The great majority of his 36 features— and virtually all the best ones—were drawn from novels, short stories, or plays; and he was invariably, though never slavishly, faithful to the spirit of the original. This quality of loving respect for his source material shines through the culminating film of his long career, The Dead. A bitter-sweet meditation on transience and mortality, The Dead is taken from the last and longest story in James Joyce's 1914 collection Dubliners. The setting is Dublin in the winter of 1904 when two elderly sisters, Kate and Julia Morkan, and their niece, Mary Jane, give their annual dinner party and dance. 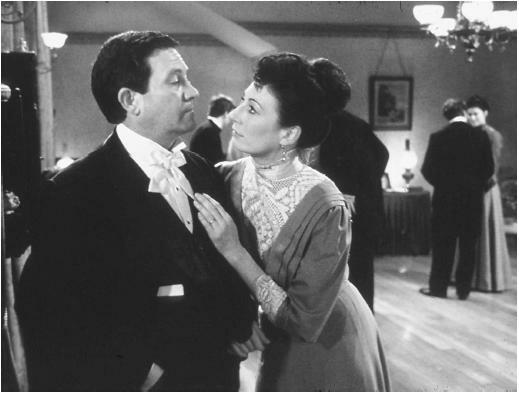 The scenario, by Huston's son Tony, sticks closely to the original story and often uses Joyce's own dialogue. On the surface, very little happens. ("The biggest piece of action," Huston noted ironically, "is trying to pass the port.") The guests assemble; they eat, drink, dance, banter, and in one or two cases flirt mildly; the party winds to its end; and in the closing fifteen minutes we follow two of the company as they return to their hotel. We seem to be watching the casual, happening flow of life, convivial but unremarkable. No voices are raised, except now and then in song; no dramatic emphases in the acting, scoring, or camerawork urge our attention. Yet every detail, unobtrusively placed, contributes to the final effect: a rare depth of poignancy, all the more moving for being so quietly expressed. When he made The Dead Huston was himself dying, and knew it. Suffering from terminal emphysema, he directed from a wheelchair, hooked up to an oxygen cylinder. He had hoped to make the film in Ireland, as a farewell to the country where he had lived for twenty years and whose citizenship he'd taken, but it proved impractical. Instead, a wintry Dublin was convincingly recreated in a warehouse in Valencia, north of Los Angeles, with a second unit sent to Ireland to pick up location shots. Much of the time, constrictions of space made it impossible for Huston to be on set with the actors, and he directed via a TV monitor. None of these limitations shows in the film, which feels effortlessly relaxed and natural. Throughout the long party sequence that takes up the first hour of the film, Huston's camera roams around the various groupings, picking up snatches of conversation, conveying unspoken nuances in a gesture or a glance. Matters of politics and religion are touched on, sketching in a sense of the period: an assertive young woman, Molly Ivors, mocks the hostesses' nephew, Gabriel Conroy, for being a "West Briton" who neglects Irish culture, and Aunt Kate tactfully refers to the Protestant Mr. Browne as being "of the other persuasion." The scapegrace Freddy Malins arrives tipsy, to the alarm of his mother who anxiously steers him away from further boozing. Mary Jane plays a showy piece on the piano; older guests listen politely while the younger ones escape to the drinks table in the next room. The cast, all Irish except Anjelica Huston (who, having grown up in Ireland, fits in seamlessly) and many of them from the Abbey Theatre company, give a note-perfect display of ensemble acting. Gradually, beneath the light comedy, more sombre themes emerge. The older, frailer sister, Miss Julia, is persuaded to sing a Bellini aria; her quavery voice suggests this will be the last year she'll be there to sing it. Talk turns to lost glories of the past, to friends now dead, to monks who sleep in their coffins as a reminder of "their last end." And alongside these intimations of mortality comes the idea of a love absolute and all-consuming when one of the guests recites an old Irish poem, the sole notable element in the film not drawn from Joyce's original: "You have taken the East and the West from me, you have taken the sun and the moon from me. . . ." During this, Gabriel casts a glance at his wife Gretta (Huston) who is listening, rapt. This brief shot foreshadows the turning moment of the film. The party is breaking up, Gabriel and Gretta are on their way downstairs, when from above comes the voice of a tenor singing a melancholy old ballad, "The Lass of Aughrim." Gretta stops on the stair, transfixed, her whole posture suggesting a sorrow long held within her like an unborn child. At the hotel she tells Gabriel how the song was once sung by a gentle boy who died—perhaps for love of her. She weeps herself to sleep, while Gabriel gloomily reflects how prosaic, by comparison, is his love for her, "how poor a part I've played in her life." He muses on the dead boy, on his aunt soon to die, on others departed, and as the snow swirls outside the window, his voice-over thoughts ease into the words that end Joyce's story: "Snow is general all over Ireland. . . falling faintly through the universe, and faintly falling, like the descent of their last end, upon all the living and the dead." John Huston's last film, an elegy for Ireland and for himself, closes on a grace-note at once regretful and reconciled.